Stay cool and focused on your goals as you train hard by pulling on for each training session the adidas Techfit Chill Compression S/S T-Shirt in Utility Black and Print Red. 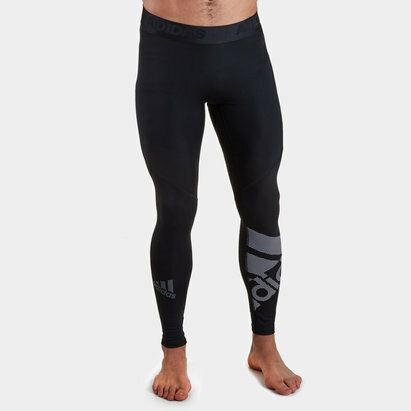 This men's short sleeve base layer t shirt from adidas has a Techfit ultra tight compression fit which is designed to help boost your performance by speeding up muscle recovery and improving blood flow. Ultra soft seams and flatlock seams reduce chafing and provide flexibility and comfort whilst UPF 50+ protection helps defend against the sun's harmful rays in outdoor training. 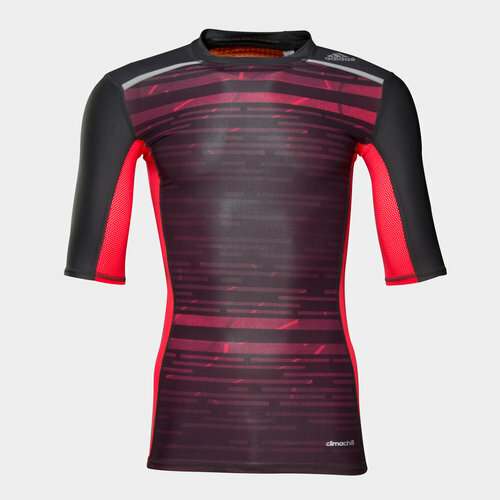 Made from stretchy polyester and elastane material, this base layer top features adidas ClimaChill technology which is designed to help keep the wearer feeling extra cool during exercise thanks to aluminium silver dots that conduct heat and draw it away from the body. They also keep the wearer dry by wicking sweat away from the skin and quickly drying off. Ventilated mesh enhances the cooling effect of the tee whilst Polygiene odour control keeps it smelling fresher for longer. Achieve the results you want whilst keeping your cool for every workout by pulling on the adidas Techfit Chill Compression S/S T-Shirt.